Discover the secrets of fishing the Gallatin, Madison, and Yellowstone with Montana's top guides. Montana Angler Fly Fishing offers guided trips and world class lodging packages on the Gallatin River and other legendary waters. Outfitter #10770. The Gallatin River begins at Gallatin Lake, which is located high in the mountains of the Gallatin Range in Yellowstone National Park, and flows for 115 miles to where it meets (and forms) the Missouri River in Three Forks. Throughout its length, the Gallatin River offers a wide variety of water, excellent river access and relatively low fishing pressure and gorgeous scenery. 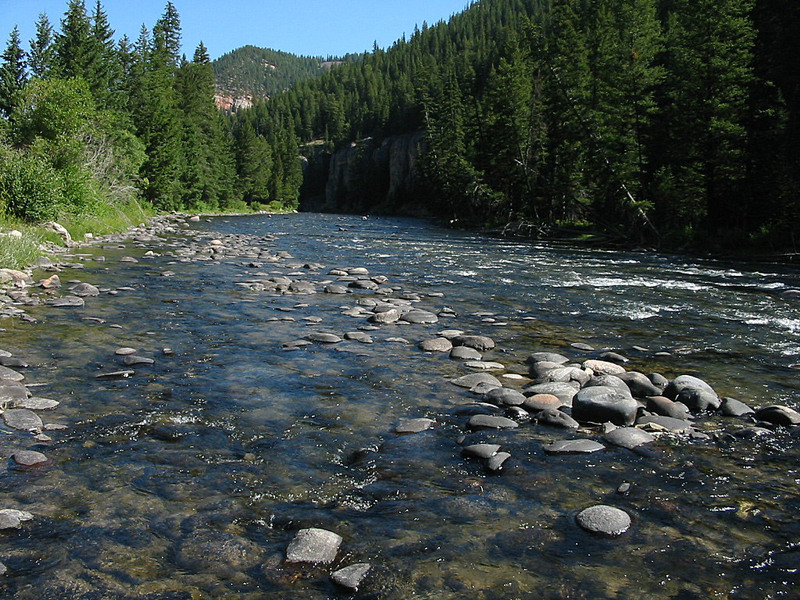 The Gallatin River runs for more than twenty-five miles in Yellowstone National Park. While in the park, any type of floating is prohibited and special fishing regulations apply. After the Gallatin River leaves Yellowstone National Park, it flows predominantly through public lands for the next forty-miles. Since a highway closely follows the river this entire distance, access is excellent. All an angler has to do to fish in the upper section of the Gallatin (above Spanish Creek) is to pull over to the side of the road and go. 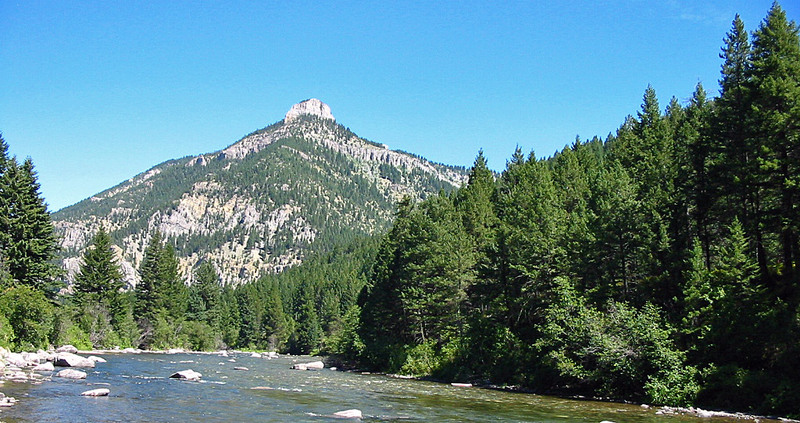 Once the Gallatin River leaves Yellowstone National Park, the river flows through very mountainous country, with steep mountains towering above the river. Extensive whitewater stretches are found on the Gallatin River, particularly downstream from the town of Big Sky. The Gallatin River for much of its length is not a very large river. As a result, float fishing on the Gallatin River from Yellowstone National Park downstream to the confluence with the East Gallatin River is not allowed, a distance of more than seventy-miles. Since the bulk of the Gallatin River is closed to float fishing (but not recreational floating), the Gallatin is a dream come true for wade anglers who are frustrated by having to share the water with lines of rafts and drift boats. Coupled with the excellent access found in the upper half, the Gallatin ranks as one of the finest wade fishing rivers in Montana, perhaps second only to Rock Creek. After traveling for more than forty miles through mountainous terrain, the Gallatin River leaves the mountains behind as it spills out into a broad, scenic valley, which also contains the town of Bozeman. Once the Gallatin River leaves the mountains, it begins to flow primarily through private land. While a number of access sites do exist, access is significantly more difficult on this section. The flows of the river also slow significantly once the Gallatin River leaves the mountains. 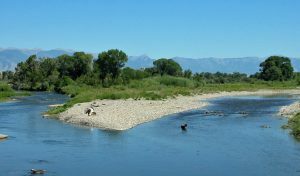 Due to slower flows and heavy irrigation use, the water in the Gallatin River on its lower stretches frequently become quite warm, hampering trout reproduction and putting a lid on feeding activity. Thirty miles after leaving the mountains, the Gallatin River meets up with the East Fork Gallatin River, which adds significantly to its flows. From this point downstream to the beginning of the Missouri River, the Gallatin is open to float fishing. Access is spotty along this stretch, since the river flows almost exclusively through private land and access sites are quite scattered. Fly reels do more than just hold line. 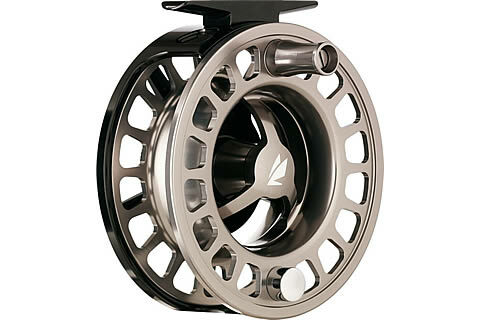 Read this guide to learn the importance of a fly reel and how to select a good one. The Gallatin River is not home to many monster trout. For anglers in search of consistently large rainbow or brown trout, visit another nearby river, such as the Yellowstone or Madison. Instead, what the Gallatin River offers is excellent dry fly fishing on a river that receives relatively low fishing pressure in beautiful surroundings. The fish are not finicky eaters, either, which makes the Gallatin River an excellent place for learning how to fly fish. Along its upper stretches, the river is not very deep, allowing easy bank-to-bank wading. The trout on the river, consisting of both brown and rainbow trout, average around 12 inches, with 16 inches considered a large trout although some lunkers exceeding 20 inches are found. Grayling and cutthroat trout are also found in the Gallatin River. This stretch of the Gallatin runs exclusively in Yellowstone National Park. 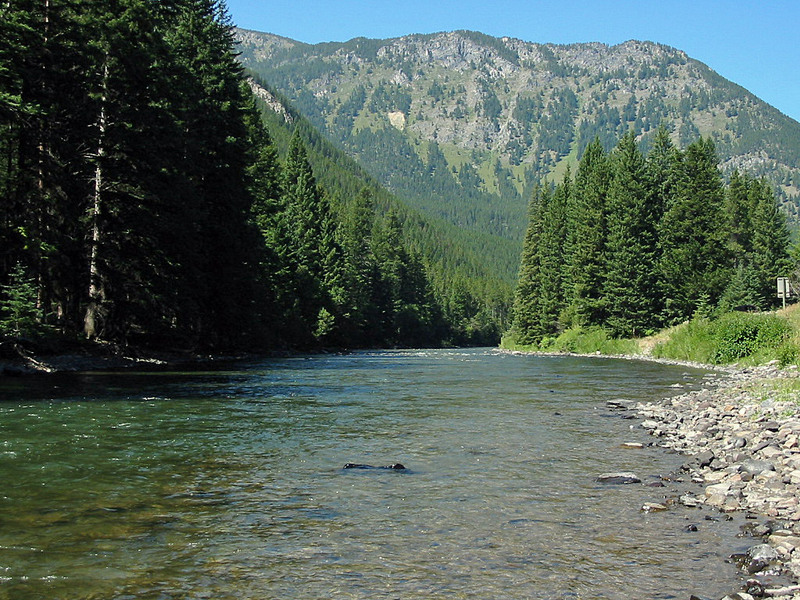 Rainbow trout, cutthroat trout and brown trout can all be found in this river section. While the fish are generally small and average less than twelve inches, fish up to sixteen inches are not uncommon. More information about this section of river is covered in the Gallatin River in Yellowstone National Park section. This section of river runs extensively through public lands and is closely followed by Highway 191, providing excellent access. 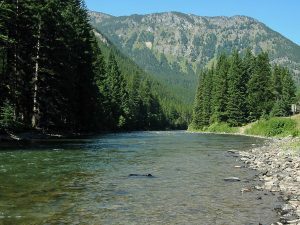 During most of May and frequently lasting until early July, this river section runs muddy and murky due to inflows from Taylors Fork, severely limiting fishing. An angler arriving during this time who finds the river in this condition should venture further upstream and fish in Yellowstone National Park. Just don’t forget to get your park fishing permit. Due to the murky water of spring run off, the best fishing on this section is before May and after high water ends, usually by late June or early July. The banks of the river are heavily forested. Tall, forested mountains loom in the distance, providing for beautiful scenery. The fishing on this section of the river is similar to that found further upstream. Standard dry fly patterns work very well. Other fly patterns for this stretch of the Gallatin River include the Spruce Moth. These moths make their appearance in July and last through the summer. 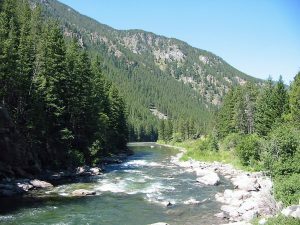 This stretch of Gallatin River roars through a steep canyon, with heavily forested hillsides and large rock outcroppings. The river has extensive whitewater in this section and can often be quite narrow as it threads its way down the canyon. This section of the Gallatin River is popular among whitewater enthusiasts, particularly those in hard shell kayaks and inflatable whitewater kayaks. Wading on this stretch of the river can be difficult. The current is fast and slippery rocks await the unsuspecting fisherman. A good pair of wading shoes is required on this stretch, and a wading staff can also prove useful. Since the water moves so quickly through this canyon stretch, fishing is also more difficult. Constant line mending is needed to prevent dragging the fly. The wooded banks and the narrow width of the river can combine to make casting difficult at times. Fishing this stretch of the Gallatin is essentially the same as between Taylor Creek and Big Sky. Standard dry flies and attractor patterns work well, in addition to the Spruce Moth come late summer. However, since the river moves so quickly, fishing this section involves fishing the pocket water, tossing the flies into the calmer pockets of the river. This section of the river has significantly slower currents than found upstream. It also has broad runs, some undercut banks and occasional pools. The valley the river flows through also is agricultural in nature, becoming more arid as the river progresses downstream. The largest trout on the Gallatin River will be found in this stretch. The Gallatin River on this stretch can be severely dewatered in places, particularly between Shedds Bridge Access Site and Gallatin Forks Access Site (where the East Fork Gallatin River empties into the Gallatin River). As a result, the best fishing on this stretch is often found above Shedds Bridge and below Gallatin Bridge. The slower flows, low water and warm temperatures wreak havoc on the trout in between these two access sites, although fish can still be found. Float fishing is not permitted on the Gallatin River in this section except for the short stretch of river from Gallatin Forks Access Site to Three Forks. As the current is significantly slower and not nearly as rocky, it’s much easier to wade fish than in the canyon stretch just upstream. Since the Gallatin flows primarily through private property, access is gained at the frequent bridge crossings. As always, the best fishing will be found a short walk up or downstream from these sites. Standard dry fly patterns, along with hopper imitations beginning in July, work very well along this stretch of river. In the stretches that are not severely de-watered, solid caddis hatches occur, providing solid fishing on flies such as the Elk Hair Caddis and Parachute Adams. Hoppers should be fished right along the bank. Additionally, for the angler wanting to try their luck with the larger brown trout in this stretch, large streamers can also be used, working them along the undercut banks and through the occasional deep hole. The lower twelve miles of the river, between Gallatin Forks Access Site and Three Forks, has virtually no access. Happily, it’s the once stretches of river that may be floated. The current is slow, so plan any float trip accordingly. Inflatable fishing kayaks and pontoon boats, due to their ease of paddling, are excellent fishing platforms for this river section. 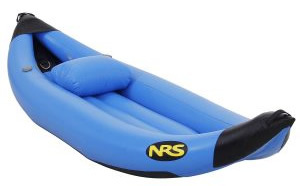 For running powerful Class IV and V rapids, nothing beats an inflatable whitewater kayak. Learn more about these fun boats. The Gallatin River is closed to float fishing from the Yellowstone National Park boundary downstream to the rivers confluence with the East Fork Gallatin River, at the Gallatin Forks Access Site. As a result, floating pressure on the river for most of its length is quite non-existent. Except for the whitewater enthusiasts that race through the canyon stretch between Big Sky and Spanish Creek Access Site in whitewater kayaks and canoes, floating on the Gallatin River is not very popular. A float down the Gallatin River provides beautiful scenery, constantly changing landscapes and some challenging whitewater for those who want to try their luck in the canyon stretch. A float on the upper stretch of the Gallatin River, between the Yellowstone National Park boundary and Big Sky provides for a very scenic float. No rapids are found. The river moves relatively quickly through forested mountains, providing wonderful views. Most fishing boats, from pontoon boats to inflatable kayaks work just fine to fish this stretch. The whitewater stretch on the Gallatin River is located between Big Sky and Squaw Creek Bridge. A number of Class III and Class IV rapids, along with numerous Class II rapids, big waves, and some big drops all combine to provide for a very wild ride. Experienced paddlers in high quality inflatable whitewater rafts, hard shell kayaks or inflatable whitewater kayaks should only consider attempting this stretch of the river. The lower stretch of the river, particularly between Stubbs Bridge and Gallatin Forks Access Site, can provide for frustrating floating. A number of diversion dams need to be portaged and water levels are frequently quite low in the summer, keeping the current slow and the water depth shallow. 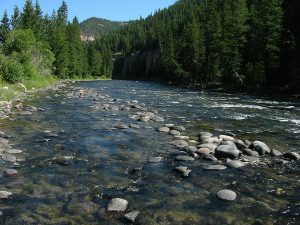 Float fishing becomes legal on the river at the Gallatin Forks Access Site, located twelve miles upstream from Three Forks. 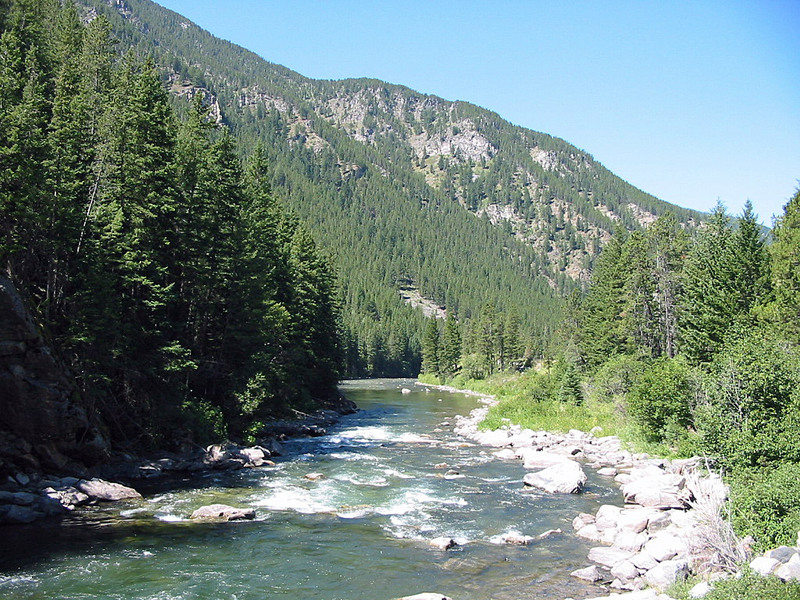 Visit the Montana FWP site for detailed information about specific fishing access sites.